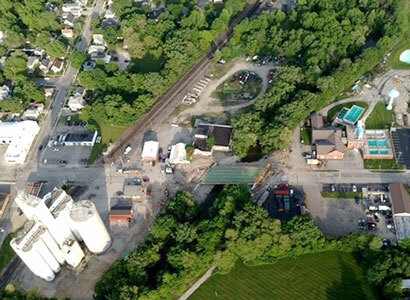 The photo above, taken from a hot air balloon, shows work during the Main Street Bridge replacement project. According to officials, the project is on track, and the bridge is scheduled to reopen June 26. The Main Street bridge replacement work is entering its final stretch, according to officials. Marysville City Engineer Jeremy Hoyt said the project is still on schedule. He said crews have recently begun pouring concrete, and will hopefully wrap up by June 26. Hoyt said while residents will be able to use the bridge at that time, crews will still be doing minor work on the structure. A fact sheet on the city’s website has the project costing the Ohio Department of Transportation an estimated $3 million. The project was completely funded by the state, with no money coming from the city. Earlier this year, officials said the bridge was nearing the end of its lifespan. According to Hoyt, it was last rehabilitated in 1991. Hoyt said based on weekly updates from ODOT, and seeing how the construction has panned out, he feels the project has been free of any major hiccups. “If it’s on schedule, I assume it’s gone smoothly,” he said. According to the fact sheet, the bridge will feature a pedestrian walkway with a barrier between it and the street. It will also have black safety railing and some minimal landscaping. In the meantime, the city has been guiding motorists to a detour that takes drivers from Maple Street to Elwood Avenue. The city has implemented a three-way stop at Elwood and Maple streets. Hoyt said he hasn’t heard many complaints about the detour lately. He said people generally raise their concerns in the first couple weeks of any project. From there, he said, the complaints trail off. Hoyt added the three-way stop at Elwood and Maple streets “seems to work out pretty well.” He said the city has received compliments how it handled the intersection. Hoyt said ODOT will continue minor work on the project after the bridge reopens. “Everything should be pretty minimal after this,” Hoyt said.